There is a long list of reasons to focus on safety in the workplace and chief among those reasons are employee protection and bottom line results. Employees are the number one resource of every company, whether or not they are treated as such. When an employee is injured, not only is it an issue that impacts that person’s life, but it reduces profits in more ways than is often realized. There is the potential cost of worker’s compensation and the cost of training someone to replace the injured worker. 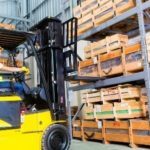 Needless to say, injury prevention should be a priority at all times, especially in warehouses where there tends to be more opportunities for injuries to occur. Many companies have safety initiatives and some even have safety programs and safety committees. These individuals within the company implement and monitor safety practices to ensure they achieve desired outcomes – zero injuries. When done right, a good safety program can also increase productivity because practices and protocols are also reviewed to ensure effectiveness. On the flip side, when an injury occurs, productivity is negatively affected and the cause is often something that could have been easily prevented. Ongoing safety training is something that all employees should receive, across all departments. It’s been said that knowledge is power, but the reality is that knowledge must be applied in order for it to have any value. Therefore, in addition to ensuring warehouse employees are trained, there should be a process of monitoring whether the training received is being applied. One way to ensure this happens is to offer incentives when employees are observed adhering to safety practices. The goal is to catch them doing something right as opposed to just looking for a wrong action. Trip and fall injuries are common when things are not in place. When productivity is high, there’s a tendency to relax safety adherence and leave things lying around that should be in its proper place. Something as simple as boxes stacked up in the corner might not seem like a problem, but under the wrong circumstances, it can be cause an accident. Putting things away where they belong can reduce falls, spills and other types of injuries related to a cluttered workspace. There should be a policy about keeping walkways clear at all times. The same applies to long cords that are notorious for causing trip and fall injuries. Additionally, it’s important to focus on safety when a company has more complex needs, such as Industrial Wastewater Pump Installation salt lake city ut. Hazardous liquids must always be labeled and remain in their proper location. There have been many times when liquids have caused warehouse injuries, including allergic reactions. This happens most when they are not properly stored or labeled. Additionally, companies must have protocols for cleaning spills that occur to ensure compliance with Workplace Health & Safety practices and alignment with requirements for Material Safety Data Sheets (MSDS). Policies should include wearing the right protective equipment when handling all substances. Other workplace safety practices include wearing appropriate attire, ensuring shelves are not overloaded and operating machinery based on the manufacturer’s guidelines.